We’ll review the 16 regionals in order of the national seeds. Bold is the host city, Blue is the host team and Red is the winner. We’ll also highlight significant players and/or guys who are big names in the upcoming draft as we get to them (MLBpipeline.com summarizes their top 200 ranked players here: i’ll just talk about the 1st round talents and players w/ local ties). In the Los Angeles regional (host: #1 seed UCLA), the big story wasn’t the tourney’s #1 overall seed, but lowly #3 seed Maryland, who upset SEC power Ole Miss and then handled the #1 team in the land 4-1 to advance to the regional final. UCLA made its way through the loser’s bracket and beat Maryland on 5/31/15, setting up a winner-take-all game to advance on 6/1, but Maryland prevailed in a 2-1 nailbiter. This sets up a most amazing super-regional matchup; read on. In the Baton Rouge regional (host: #2 seed LSU), #2 overall seed LSU breezed into the region final, where they beat UNC-Wilmington 2-0 to advance. Players of note: likely upper 1st round pick Alex Bregman had a relatively quiet regional at the plate. In the Louisville regional (host: #3 seed Louisville), Louisville made quick work of this regional, winning 3 straight games to become one of the first teams to advance. Ace Kyle Funkhouser was thrown, oddly, in the opener against tiny Morehead State and was good but not great (2ER in 7ip), another sign that his draft stock is falling. Nonetheless, Louisville did not look stretched in this regional, beating Michigan 13-4 to advance. In the Gainesville regional (host: #4 seed Florida), Florida (who I thought could have been the #1 overall seed) made quick work of its regional, defeating each of the other 3 participants en route to a 2-1 victory over Florida Atlantic in the final. In the Coral Gables regional (host: #5 seed Miami), Miami seemed to be in control of the regional, but was stunned by Ivy league champ Columbia, who forced a winner-take-all game on 6/1. In that final game, Columbia finally ran out of gas and Miami embarrassed the Ivy Leaguers 21-3. Players of note: Miami’s ace (and Nats 2014 2nd round pick) Andrew Suarez threw 7innings of 2-run ball to get the win in the opener. In the Champaign regional (host: #6 seed Illinois), the host team cruised to the region final, where they face upstart Wright State on 6/1/15. In the final, Illinois handled Wright State to advance. Players of note: Illinois closer Tyler Jay,whose usage this season has been deplored by scouts, did not even appear in his team’s first two wins, each a complete game by the starter. In the region final, he closed out the game and showed off his arm, giving up 1 hit and a walk in four innings of work. Jay is projected as an upper 1st round pick and a future starter … why he’s not being used as such in college is beyond me. In the Fort Worth regional (host: #7 seed TCU), NC State upset the host team to make the region final, but TCU fought their way out of the losers brack and forced a deciding 6/1/15 game. After forcing the winner-take-all game, TCU rallied from an 8-1 deficit in the 8th inning to force extra innings and win on a walk-off to advance to the super-regional in perhaps the tourney’s best game. In the Springfield regional (host: #8 seed Missouri State), Missouri State lived up to its national seeding by cruising through the regional without a loss. Players of note: Missouri State Ace Jon Harris threw 8 innings of 1-run ball to get the win over Canisius in the opener. Harris has quietly put together a strong year and looks to be a back-of-the first round pick. In the Stillwater regional, (host: #9 seed Oklahoma State), 2nd seeded Arkansas made quick work of the regional, with host Oklahoma State not even making the regional final. The 4th seeded St. Johns team pushed Arkansas but ultimately lost 4-3. Players of note: Arkansas projected 1st rounder Andrew Benintendi went 4-11 for the regional but took an o-fer in the regional final. In the College Station regional (host: #10 seed Texas A&M), California (whose baseball program was one step from the grave a few years ago) upset the host to make the regional final, but TAMU forced a deciding 6/1 game. In that game, TAMU won a well played 3-1 game that had both sides wishing these two teams played more often. In the Nashville regional (host: #11 seed Vanderbilt), Vanderbilt awaits local team Radford, who lost to Indiana early but got revenge to make the regional final. In the final though, Radford ran out of gas and Vanderbilt advanced by the amazing score of 21-0. 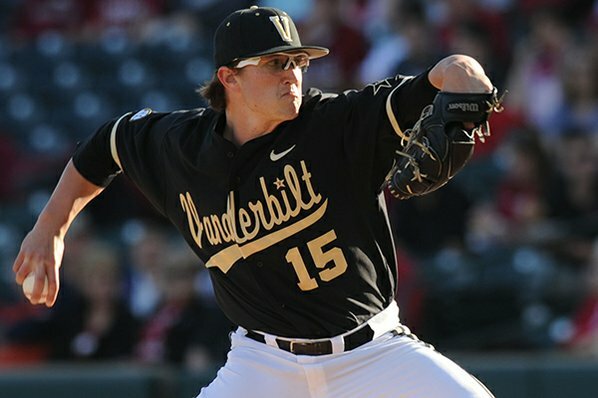 Players of note: Carson Fulmer pitched 7 innings of 1-run ball in the opener for the victory, potential first overall pick Dansby Swanson connected for his 14th homer in the 2nd game, and Walker Buehler was removed after 5 innings thanks to his team’s 10-run 5th inning. Note: most of Radford’s squad is VA-based; I’ve never covered players heading there since it isn’t a destination baseball program. But tourneys like this can lift up a program’s credentials, so we’ll take note of Radford commits more closely going forward. In the Dallas regional (host: #12 seed Dallas Baptist), local entry VCU made some waves early by reaching the winners bracket final, taking out host Dallas Baptist and Oregon State easily. The host team made its way back to the regional final and has to sweep a 6/1/15 double-header to advance. DBU forced the winner-take-all game, but VCU outlasted them in the final to be the only #4 seed to advance t his year, and perhaps one of the most unlikely #4 seeds to win a regional in the tournament’s history. Note: VCU’s squad is a lot more national than I would have guessed, but do have some players with local ties. In the Tallahassee regional (host: #13 seed Florida State), College of Charleston had to sweep a 6/1 DH from the host to advance, but they couldn’t get going an Florida State advanced easily. Player of note Taylor Clarke (Ashburn native and Broad Run HS grad) got hit hard in the opener against Auburn but did not factor in the decision. In the Fullerton regional (host: #14 seed Cal State-Fullerton), host Cal State-Fullerton pounded upstart Pepperdine 10-1 to win the regional in three straight games. In the Houston regional (host: #15 seed Houston), host Houston lost a 20-inning heartbreaker to city rival Rice to be eliminated; this was one of those games you see and cringe, because both teams had guys come out of the bullpen to throw 9 innings (as far as I can tell, both teams used mid-week starters, and did not have middle relievers suddenly throwing 110 of the highest leverage pitches of their lives). Rice has to sweep Louisiana-Lafayette twice on 6/1 on about 6 hours of sleep in order to advance, but couldn’t even win the first, losing 5-2 to send the Rajun’ Cajuns to the super-regional. In the Lake Elsinore regional (host: #16 seed UC Santa Barbara), UVA showed how badly it was under-seeded by advancing to the final by taking two close games. Connor Jones (Great Bridge HS in Chesapeake) gave up just 1 run in nearly 8 innings to win the opener and Brandon Waddell pitched even better to beat San Diego State. The regional final was wild, with UVA scoring 3 in the 8th to tie it and then 5 in the 11th to win 14-10 over USC to advance. In the 3rd game, UVA threw out all kinds of names familiar to readers here: Alec Bettinger (Hylton grad from Woodbridge) got the start but failed to record an out. He was relieved by Tommy Doyle (Vienna VA, Flint Hill) and got the game to UVA’s middle relievers. Josh Sborz finished all three wins off. Joe McCarthy struggled on the weekend, going just 1-6 in the final. Nathan Kirby remains sidelined but could return for the Super-Regionals, bad news for whoever they face. Other players of note in the regional: Upper-1st round draft talent Dillon Tate had 11 strikeouts in 8 innings, but gave up 4 runs and was out-dueled by San Diego State’s Bubba Derby in what was likely his last amateur appearance. UCSB was badly exposed, getting crushed in its loser’s bracket game and becoming the only seed to go 2-and-out. 11 of 16 hosts advanced, including 7 of 8 National seeds. This is a far cry from 2014, which lost most of its national seeds early. This tournament is setup to be much more “chalk” than in years’ past. 5 = number of regionals forced into the “extra” deciding game. Most of them were good; a couple were laughers. 10 of the 16 regionals were extended to Monday games, some thanks to weather, some thanks to the regional getting extended to the “extra” deciding game. 11 number one seeds, 1 number two seeds, 3 number three seeds and 1 unlikely number four seed (VCU) advanced to the supers. 6 number of #4 seeds who didn’t finish 4th in their regional: lots of overseeded 2/3 seeds ended up going two-and-out. In fact, three #4 seeds pushed their way to the regional final: VCU (who won), St. Johns and Pepperdine (clearly under-seeded). 1 host that went 2-and-out: the clearly undeserving host UC Santa Barbara. Now, they were the 16 seed, but college pundits howled at their selection as host over a team like College of Charleston. 9 = the number of extra inning games, including the epic 20-inning Houston-Rice game and the NC State-TCU winner-take-all extra innings affair. 6 of the regionals went pure chalk, a good indication of the job the seeding committee did this year. Biggest upsets: Maryland over #1 overall seed UCLA is the clear big-time upset. Arkansas beating #9 Oklahoma State (who some thought should have been a national seed) probably was the 2nd biggest upset. Most surprising regional winner: VCU, who becomes just the 5th #4 seed to advance out of a regional since the field expanded to 64 in 1999. But VCU is the most surprising team; the other #4 teams who advanced at least had prospects. My Predictions: I was wrong about Illinois and Missouri State but was right about TCU struggling to get by NC State. I was right in saying the rest of the national seeds should win but wrong on UCLA; nobody saw that coming. In the 9-16s, I was right about UC Santa Barbara, wrong on Fullerton and right about Dallas Baptist … just wrong on which team was going to win. 4 ACC teams (out of 7 that made full field). 5 SEC teams (out of 7 that made full field). 2 Big-10 teams (out of 6 that made the full field). 0 Pac-12 teams (out of 5 that made full field). Per the d1baseball post above, this is the first time since the 64-team expansion that a Pac-12 team failed to make the super-regional field. In fact, there’s just one team west of Texas in the super-regional (Cal State-Fullerton), who will be a big underdog at Louisville. For me, this confirms what I’ve often thought; Pac12 baseball tends to get overrated. The remaining 5 super-regional teams are from one-bid conferences: TCU, Missouri State, Fullerton, Louisiana-Lafayette and VCU. Its clearly an ACC/SEC kind of year. Super Regional Matchups: The super-regional hosts were announced just after the last regional ended. What an amazing set of circumstances: our two local teams (UVA and UMD) both fly 3,000 across the country to … setup a repeat of last year’s UVA-held super regional. Who would have thought. I’m not quite sure why Arkansas gets to host over national seed Missouri State; that’s got to be a point of contention for that deserving program. Three great intra-state matchups featuring great teams from Florida, Louisiana and Texas. The super-regionals could be pretty fun. UVA gets Kirby back and holds off Maryland. LSU and Louisville cruise. Florida outclasses the over-achieving Florida State rival. Miami pounds the “just happy to be here” VCU team. 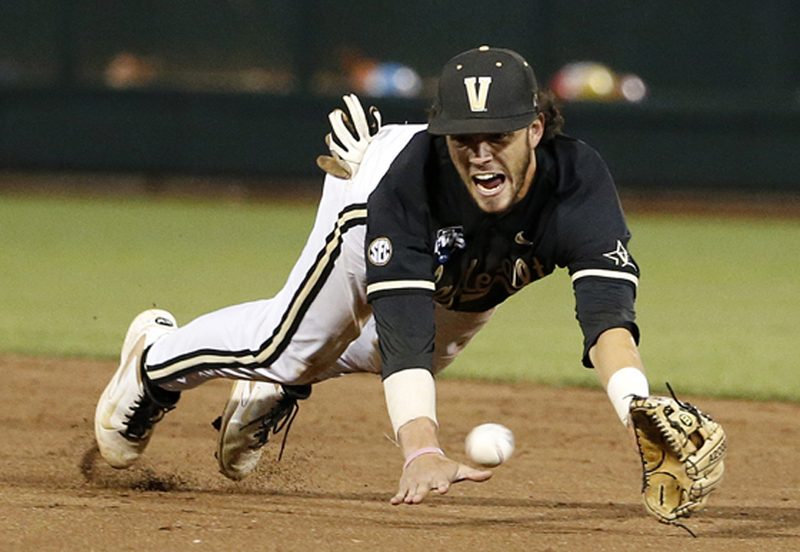 Vanderbilt “upsets” by seed Illinois, who can’t handle the talent level Vandy puts out. Texas A&M beats TCU and Missouri State blasts Arkansas after being insulted by losing hosting rights as a national seed. For the third year running (here’s 2013’s wrap-up and here’s 2014’s wrap-up of drafted local players) we’re going to keep an eye on “local” draft prospects leading up to the 2015 amateur draft. By “local” I essentially mean anyone who hails from the DC/MD/VA areas plus anyone who is playing their college ball here. To compile this list, I looked at rising college juniors and rising prep seniors who made impacts in 2014 or who have made a name for themselves with summer league performances in 2014. Here’s a link to the WP’s 2014 all-Met team, which had more than a few juniors, all of whom are mentioned here. Here’s the roster for Perfect Game’s big summer 2014 showcase, which is the first place a lot of rising prep seniors get scouted. Here’s a link to Louisville’s 2014 All-American selections, looking for junior all-american nominees. Here’s a link to the EvoShield Canes 17U Roster, the leading travel team in the area and where a number of these upper-end prospects played this past summer. Here’s the BaseballDraftReport blog that has been doing some tracking of prep players ahead of the 2015 draft. Here’s Fangraphs’ Kiley McDaniel “way too early” draft rankings from Oct 2014. Here’s BaseballAmerica’s first 2015 draft ranking from Mid Oct 2014. Here’s minorleagueball.com’s “early 2015 draft” prospect list. Here’s USAToday’s pre-season HS all-american list (though there are no local first teamers). Cody Morris, RHP for 2014 3-A state champion Reservoir HS (Fulton, just south of Columbia). 2014 All-Met, 2014 Louisville All-American, Maryland Gatorade player of the year. He’s committed to South Carolina but a repeat of his 2014 season could have him rising up draft boards. Played for EvoShield this summer and was at the PG National showcase event. A.J. Lee, a SS/RHP for 2014 WCAC/DCSAA champion and Washington Post final 2014 #1 team St. Johns (DC) who hails from Millersville. He was also named to the 2014 all-Met team and was a 2nd team Louisville All-American. Lastly he was the DC Gatorade player of the year in 2014. He’s committed to Maryland. Connor Eason, LHP for 2014 Virginia 5-A state champs Hickory (Chesapeake). Also played for for EvoShield this summer and is a UVA commit. John DeFazio, OF/RHP for Madison HS (Vienna). 2014 All-Met, committed to Virginia Tech. Brody Cook, INF for Riverdale Baptist. 2014 All-Met, committed to VCU. Played for Demarini Stars this summer. On BaseballDraftReport’s pre-2015 season watch list. Nathan Eikhoff, who plays for Patriot and was a 2014 All-Met after hitting an astounding .541 in the spring season. UVA commit. Played for Demarini Stars this past summer. Harvey Logan, C for 5-A state runner up Douglas Freeman (Richmond). He was at the PG showcase, played for EvoShield and is an early commit to Wake Forest. Jordan Carr, P for Archbishop Spalding (Severn, between Annapolis and Baltimore). 2nd team all-met in 2014. Ljay Newsome, P for Chopticon (south of Waldorf), 2nd team all-Met in 2014. Stevie Mangrum, 3B for Western Albermarle HS (Charlottesville), was at the PG Showcase. Committed to Va Tech and played for EvoShield this summer. Kaleb Bowman, RHP for Woodgrove (Purcellville), honorable mention All Met for 2014, played for EvoShield this summer and verbally committed to South Carolina. Danny Blair, CF for Gilman (Baltimore), committed to South Carolina, played for EvoShield and was at the PG National showcase. Evan Sperling, RHP for Grafton (Yorktown/Newport News), committed to UVA and played for EvoShield. Nathan Trevillian, RHP for Amherst County HS (near Lynchburg), committed to Liberty and was at the PG National showcase. Grant Donahue, RHP for Decatur HS in Berlin (outside Ocean City). At the PG National showcase, played for EvoShield, committed to UVA. Hunter Parsons, RHP for Parkside HS in Salisbury, committed to Maryland, at the PG National showcase and played for EvoShield. Up to 93 on the gun at showcases. Could show up on draft boards with a couple more ticks on the gun. Paul Hall, LHP for Maury HS in Norfolk. Committed to Virginia Tech, up to 90 on the gun, played for EvoShield. James Monaghan, 1B for LaPlata HS. Committed to Campbell, played for Evoshield’s regional 17U team. Hunter Byrnes, 2B for GW-Danville. Same HS as last year’s 4th round pick Blake Bivens. Good athlete (also a star QB) who may not get drafted but could be a good Div-1 player for someone. I give a lot of weight to playing on the Evoshield Canes, as you can see. If a guy is on that team, odds are he’s playing Div 1 somewhere. Local College draft-eligible players to keep an eye on for 2015: (2014 pre-season Baseball America all-american team link here, 2014 Baseball America post-season All American team here, 2014 Golden Spikes semifinalist announcement here, 2014 Rawlings/ABCA All-American list link here. 2014 All-ACC College Baseball team. 2014 All-CAA College Baseball team. 2014 All Atlantic-10 College Baseball team. All Big South, All Conference USA teams. Mike Matuella, RHP from Duke (via Georgetown Prep HS and Great Falls, VA). Burst onto the scene in 2014 and is in the mix for 1-1 overall already. Huge guy (6’6″) with a huge arm (sits mid-90s). Upper 1st round projection ahead of 2015 season. Baseball America had this feature on him ahead of the season in mid January. Here’s a scout.com report from 2/19/15. 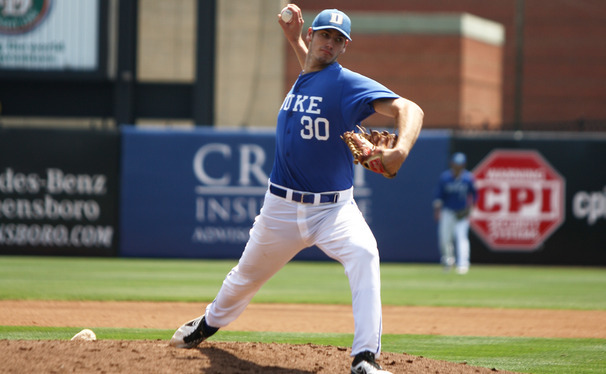 He missed a start with a minor injury early on (thanks to persistent 30-degree weather in the area), but has come back and as of the time of this posting has a 0.44 ERA through 20 innings/5 starts for Duke. 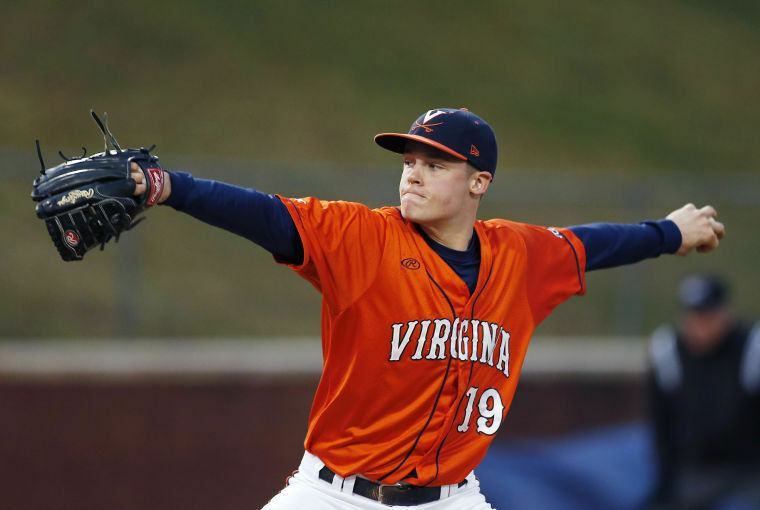 Nathan Kirby, LHP from UVA (via James River HS in Midlothian) who was a first team all-ACC, 2014 Golden Spikes semi-finalist, a BA All-American, ABCA All-American. Projected top 10 first round pick pre-2015 season. So far into the college season, Kirby has lived up to his billing, holding a 3-1 record with a 1.16 ERA as UVA’s friday starter. Joe McCarthy, OF from UVA who hit in the middle of UVA’s order in 2014 and was named All-ACC. Projected mid 2nd round pick by BA ahead of 2015 season. McCarthy suffered a back injury prior to the season’s beginning and will miss the first 12 weeks of the season; he’ll have precious few looks to get his draft stock up prior to the Rule 4 draft. 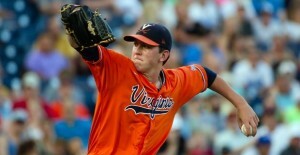 Brandon Waddell, LHP from UVA. UVA’s #2/Saturday starter was 9-3 with a 2.57 ERA on the year in 2014. 2nd-team All-ACC. So far in 2015 he’s gotten hit though, holding just a 3.48 ERA through 6 starts. Taylor Clarke, College of Charleston’s Friday starter and breakout 2014 player, hailing from Ashburn and featured previously in the Washington Post. So far in 2015, he’s only improving his stock, holding a 55/8 K/BB ratio through his first 39 2/3 innings. Josh Sborz, RHP from UVA (by way of McLean HS). UVA’s #3/Sunday starter in 2014 but has been re-assigned as UVA’s closer in 2015 in favor of former Virginia prep standout Connor Jones entering the rotation. Thus far at the time of this posting, Sborz has 5 saves but just a 3.00 ERA through 18 innings across 11 appearances. John La Prise, inf from UVA who hit .358 in 2014, but who has only played in 4 games thus far in 2015. He is on Minorleagueball’s preliminary 2015 draft list, but he was fighting injuries prior to the season and may still be doing so. 3 sophomore All-CAA players from William & Mary: Catcher Ryan Hissey, DH Charlie Gould and RHP Joseph Gaouette. Thus far in 2015, Hissey and Gould have picked up right where they left off, but Gaouette has yet to appear for the Tribe. Some draft eligible players from U-Maryland: Alex Robinson, LHP, Jake Drossner LHP, Lamonte Wade LHP/OF. With Maryland’s rising national ranking (#11 in the 3/23/15 d1baseball.com rankings), these guys will continue to see their stock rise. Smaller college guys like Kyri Washington, OF at Longwood and Dylan Nelson, RHP from Radford. Did I miss anyone? I’m all ears. The publication Collegiate Baseball Newspaper recently announced its Top 40 college baseball recruiting classes, and 2014 CWS runner-up UVA was ranked 9th. LSU, Wichita State, Florida, San Diego and Oklahoma State comprise the surprising top 5, though the rest of the top 10 contains some of the expected collegiate powerhouse programs. In late October, Baseball America ranked UVA’s class even higher, at #2 in the country behind only LSU. (Also: UVA announced their 2015 schedule on 9/25/14, schedule here). (Here’s what I wrote about UVA-committed players after the 2014 draft, and some of these guys were covered in my “pre-2014 season draft prospects” piece). – Derek Casey: he’s the player I’d be most happy about coming to school, were I a UVA fan. He was a 3rd round talent, undefeated in his HS pitching career, 93-94 on the gun. He should go far towards replacing the arms UVA stands to lose after next season to the draft (basically, all three of their projected weekend starters are Juniors in 2015). – Pavin Smith probably replaces Mike Papi like-for-like in the lineup; big lefty 1B/OF type. Well regarded nationally. – Charlie Cody was more highly ranked on prospect boards before his Senior year; he’s a good bat addition. At one point early in 2014 he was ranked as high as #34 for all HS prospects nation-wide by one ranking service. – Bennett Sousa is another guy who got a lot of national recognition even if he wasn’t drafted. 93mph from the left hand side, another future starter. – Tommy Doyle: its hard to say just how good he is: yes he got drafted (by the Nats in the 34th round) but his drafting seemed to be one of those “draft a local kid to appease a part-owner’s buddy” kind of things. He pitched at a small high school (Flint Hill Prep in Oakton) with almost no competition, making it really tough to gauge how good he is. He also played for a no-name travel team instead of someone like the Evoshield Canes. What he does have going for him is his size: he’s 6’6″ and hitting 91, which probably comes out of his hand about a foot closer to the plate than a guy who is 6′ even, making it look that much faster. If he can add a few mph, he’ll be a beast. – Jack Gerstenmaier, like Cody, had his stock drop in 2014 for whatever reason. He was a 1st team PerfectGame All-American for the region at one point. But Gerstenmaier-Cody could be UVA’s double play combo for years. Of the rest of UVA’s announced class, I don’t know anything about them, even the local guys. I’d guess that a couple of them are good talents … but most of them might be on minimal-to-no scholarship. UVA lost a big-time recruit last minute in Devon Fisher (no relation to 2014 supp-1st round pick Derek Fisher); he was a catcher from Portsmouth who got drafted and then signed with Boston. 20th rounder so probably not for a lot of cash, which makes it that much more of a surprise. He would have pushed this class up the rankings for sure. With the new draft rules in place, its likely that guys like Cody, Casey and Gerstenmaier let it be known they had strong college commitments and thus that hampered their draft status. Same thing happened to Conner Jones last year. Good for UVA that they draw so well. 2015 rotation: Kirby, Waddel, Sborz on weekends, one of the freshman/sophomores (Jones?) mid-week. 2016 rotation: Choosing from Jones, Bettinger, Sousa, Doyle and Casey. not bad.